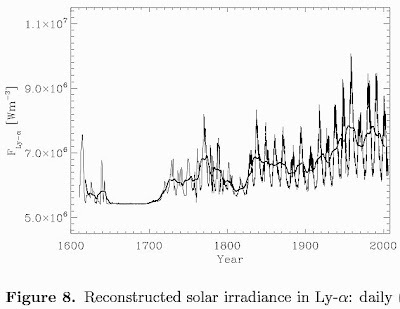 A peer-reviewed paper published today in the Journal of Geophysical Research finds that reconstructions of total solar irradiance (TSI) show a significant increase since the Maunder minimum in the 1600's during the Little Ice Age and shows further increases over the 19th and 20th centuries. 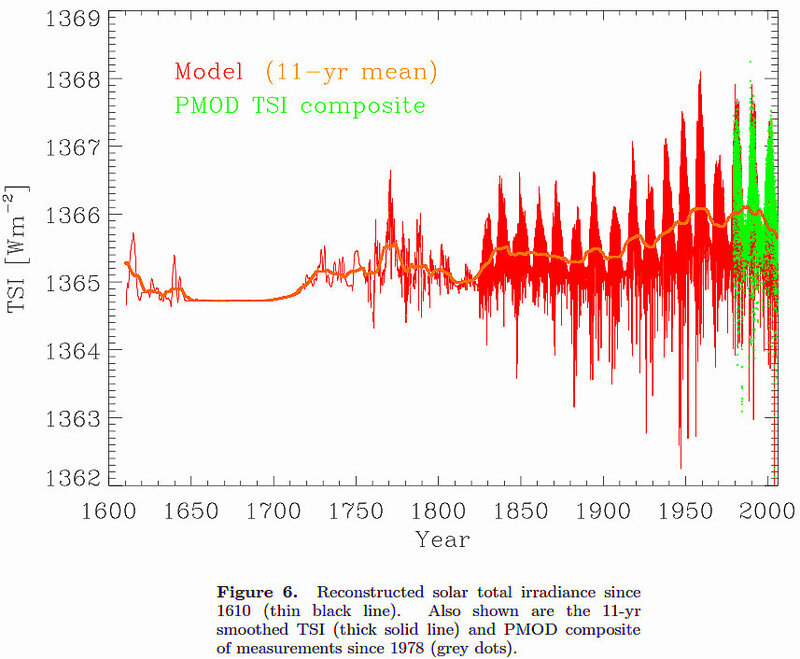 The TSI is estimated to have increased 1.25 W/m2 since the Maunder minimum as shown in the first graph below. Use of the Stefan-Boltzmann equation indicates that a 1.25 W/m2 increase in solar activity could account for an approximate .44C global temperature increase [the HADCRU global warming from 1850 to 2000 is .55C]. A significant new finding is that portions of the more energetic ultraviolet region of the solar spectrum increased by almost 50% over the 400 years since the Maunder minimum (second graph below). This is highly significant because the UV portion of the solar spectrum is the most important for heating of the oceans due to the greatest penetration beyond the surface and highest energy levels. Solar UV is capable of penetrating the ocean to depths of several meters to cause ocean heating. whereas long wave infrared emission from "greenhouse gases" or the sun is only capable of penetrating the ocean surface a few microns with all energy lost to the phase change of evaporation with no net heating of the ocean. Solar UV irradiance also "exerts control over chemical and physical processes in the Earth's upper atmosphere" such as ozone levels. Solar irradiance is the main external driver of the Earth's climate. Whereas the total solar irradiance is the main source of energy input into the climate system, solar UV irradiance exerts control over chemical and physical processes in the Earth's upper atmosphere. The time series of accurate irradiance measurements are, however, relatively short and limit the assessment of the solar contribution to the climate change. 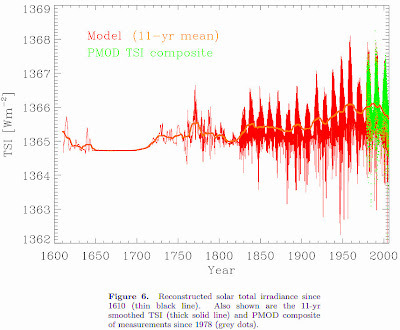 Here we reconstruct solar total and spectral irradiance in the range 115–160,000 nm since 1610. The evolution of the solar photospheric magnetic flux, which is a central input to the model, is appraised from the historical record of the sunspot number using a simple but consistent physical model. The model predicts an increase of 1.25 W/m2, or about 0.09%, in the 11-year averaged solar total irradiance since the Maunder minimum. 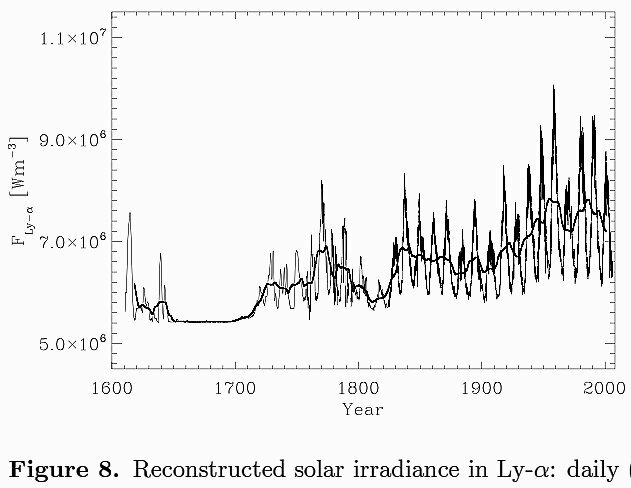 Also, irradiance in individual spectral intervals has generally increased during the past four centuries, the magnitude of the trend being higher toward shorter wavelengths. In particular, the 11-year averaged Ly-α irradiance has increased by almost 50%. An exception is the spectral interval between about 1500 and 2500 nm, where irradiance has slightly decreased (by about 0.02%). Good find! And Merry Christmas to the Hockey Schtick. thanks and same to you tallbloke! Dude, the 1.25 W/m^2 is in the total solar irradiance, TSI. You have to multiply that by 0.7 (the coalbedo), and then divide by 4 (for geometry- the area of the earth facing the sun is pi*r^2, but the total area of the earth is 4*pi*r^2) to get the TOA radiative forcing. So you're talking about more like 0.1 °C of global warming due to the sun, assuming modest positive feedbacks. OK dude, leaving out the primary point of this post that the UV wavelengths that can actually heat the oceans (81% of Earth surface area) increased almost 50%, explain how the IPCC-claimed 4 W/m2 warming from doubled CO2 (the LWIR of which CANNOT heat the oceans) leads to catastrophic 3C warming while SB indicates 4 W/m2 would theoretically (wrongly because of Beer's Law and several other reasons) result in ~1.37C warming. Oh yeah, the non-existent positive feedbacks. Yep those empirically measured positive feedbacks.